Used Copy Machines and Refurbished Printers For Sale in Tacoma, WA - Copier Maintenance Technology, Inc. While acquiring the latest technology for your business enterprise may help in areas of management and communication, searching for the best performance and function to meet your needs can be found by shopping around for reliable used copy machines for sale. We specialize in selling most major brands of pre-owned equipment that is frequently the best option for those who may be concerned about up-front costs. Call Copier Maintenance Tech, Inc. to guide you through the variety of options and performance capabilities to ensure that the unit you select from our copy machines for sale will be sufficient for your operations. Purchasing one of our refurbished printers for sale has the advantage of knowing that all of the noteworthy improvements and fixes required for reliability and compatibility have been resolved after seeing real world use. Each of our refurbished printers from wireless to all-in-one units have been updated, evaluated, tested for reliability and marked for the general printer population. The savings over a new unit are significant, and with our successful history of delivering powerful systems in “like-new” condition, you can be assured of receiving a productive high-quality unit from the moment it arrives. Call today to discover the benefits of refurbished printers! We can help stretch your equipment budget when purchasing used copiers and printers from us that are capable of producing a sizable volume of quality copies every single day! We specialize in selling reliable used copiers that can dramatically improve the value of printed materials for your business, and lead to office workflow efficiency. 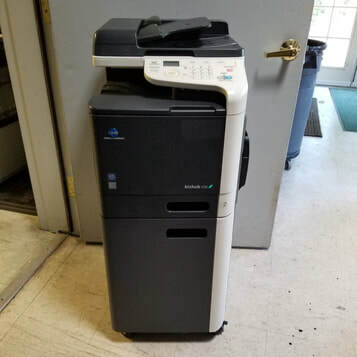 If you are starting a new business, or expanding your present business and are uncertain as to the eventual print volume, consider used copy machines for sale or used copiers as a low risk investment.